Nestled in the city of Kent and voted one of Washington's "Best Places to Live" by Seattle Metropolitan Magazine, sits Red Lion Inn & Suites Kent Seattle Area. Our comfortable Kent, WA hotel is just a short drive from the metropolitan city of Seattle, where you'll find exciting attractions. For a more relaxing day, you'll find the 14 mile Interurban Trail bordering the Green River just outside our Kent hotel. Comfortable and clean, our accommodations will make you feel right at home. Every room is outfitted with the finest amenities, including complimentary Wi-Fi, which is available throughout the hotel. Our hotel in Kent, Washington is pet-friendly (please note our suites do not allow pets), so your four-legged friend can enjoy Red Lion's signature blend of comfort and convenience as well. Additionally, every morning, guests awake to Red Lion's breakfast, a bountiful hot buffet that is complimentary with your stay. 600 square feet of deluxe meeting space is well-equipped with modern audiovisual equipment and can accommodate gatherings of up to 48 guests. After you've enjoyed success in the boardroom, stop by our indoor swimming pool for a quick dip or enjoy an energizing workout at our 24-hour fitness center. 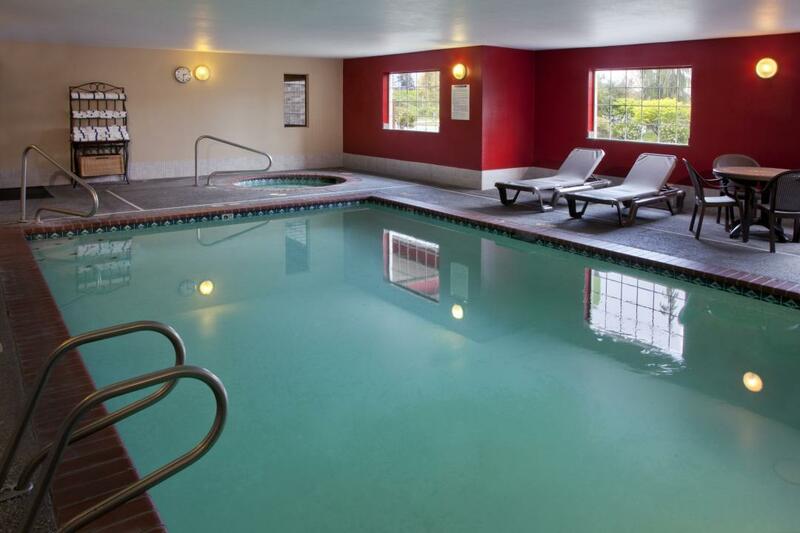 A top choice in Kent hotels, Red Lion Inn & Suites Kent Seattle Area offers a variety of exceptional features to ensure your stay is comfortable and enjoyable. Our indoor heated pool is perfect for soaking away travel stress, and you can start each day with our complimentary breakfast buffet. For conferences, meetings, and special occasions, our Kent hotel offers 600 square feet of versatile function space - complemented by tailor-made planning and catering services to deliver a memorable gathering for your guests and a stress-free experience for you. Discover one of the best choices among hotels in Kent. At Red Lion Inn & Suites Kent Seattle Area, we want to help you find what you may have lost during your stay with us. Please contact our hotel directly with questions at (253) 520-6670. We have rooms specifically designated for you and your furry family members, with close access to the outdoors. To learn more about our pet policy, pet-friendly rooms, and room availability, please give us a call to ensure a pet-friendly room is available. Pets are an additional $15.00 per stay and $100 deposit. *please note the suites are not pet-friendly. 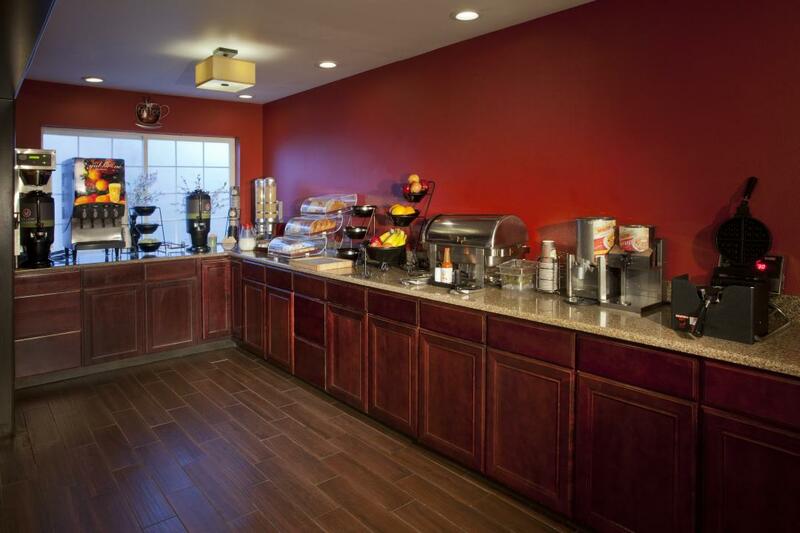 Guests of Red Lion Inn & Suites Kent Seattle Area rise and shine each morning to Red Lion's signature breakfast, which is complimentary with your stay. The hearty selection includes a signature egg dish, sausage, signature waffles, bagels, assorted pastries, cereal, and breads with coffee and juices. After you've filled your belly with breakfast, you're certainly ready for a day of sightseeing in Kent. While you're out on the town and feeling a bit hungry, we recommend the following restaurants in Kent, WA for a delicious and satisfying meal. Our Café2Go offers an inviting lounge area adjacent to the front desk and lobby, making it the perfect location for morning coffee on your way out. Its grab-n-go concept incorporates a quick menu with hot items, allowing you to get out and about quickly. Its savvy creations allow for smart, productive power lunches between meetings. 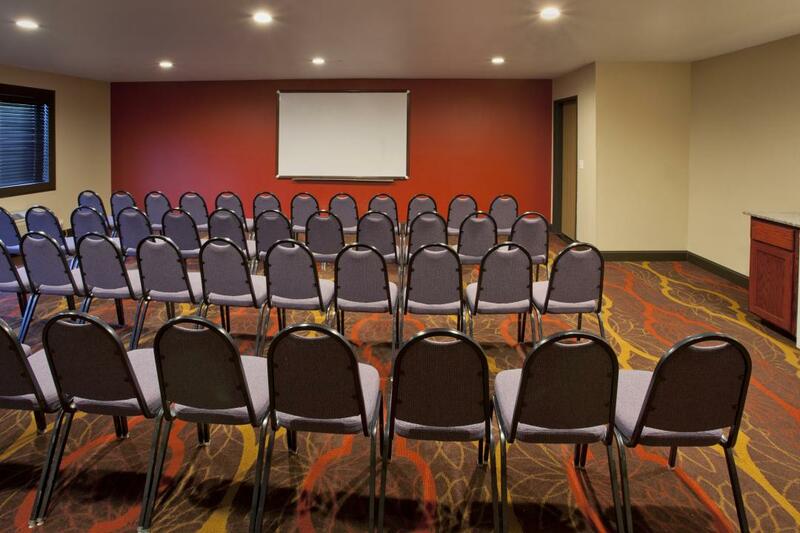 Red Lion Inn & Suites can provide you with productive, spacious Kent, WA event facilities and expert event professionals. Our 600 square foot can accommodate up to 48 guests. Our meeting space in Kent, WA is outfitted with modern presentation equipment along with high-speed Wi-Fi, which is available throughout the hotel. Our professional meeting specialists are experts at planning the perfect meeting, whether it is a meeting for 10 or a conference for 40. Although we do not offer catering services at our event facilities in Kent, WA, our team will be happy to recommend several of our trusted vendors and will help you to coordinate any of your catering needs. We can also assist in renting additional audiovisual equipment for your presentation or in arranging room blocks for your guests. For more information on planning your next meeting at Red Lion Inn & Suites Kent, please contact us at (253) 520-6670. At Red Lion Inn & Suites Kent Seattle Area, we recognize the hard work that our local, state and federal government employees provide, which is why we’re excited to offer the per diem government traveler rate at our Kent Hotel. 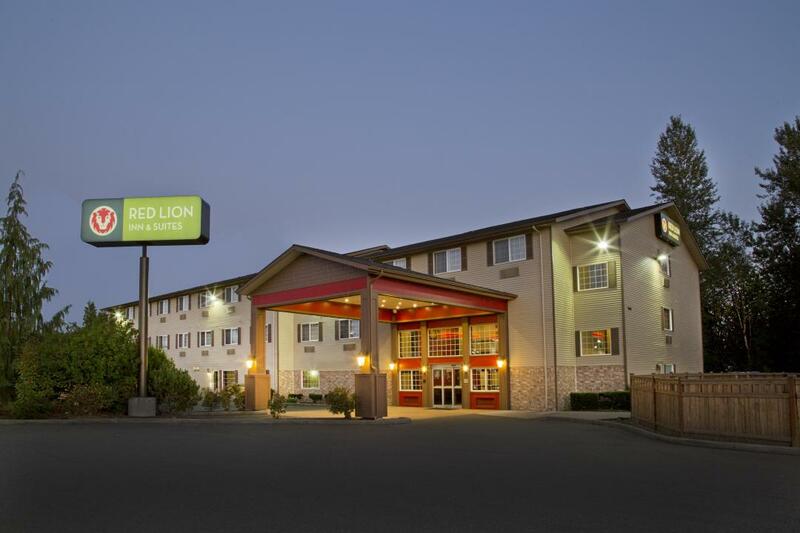 Fueled by government activity, Red Lion Inn & Suites Kent Seattle Area is an ideal Kent location to rest and recharge. For the best government discounts on Kent hotels, look no further. Terms: Guest must have valid government ID at check in to our Kent Hotel. Active duty/retired military personnel, federal, state & local government, cost contractors, staff of public schools, colleges, and universities, and employees of foreign governments are eligible for the per diem rates. Your adventure in Kent begins right outside of Red Lion's front door. One of our favorite things to do in Kent, WA is to walk along the Interurban Trail, a 14 mile walk along the Green River. Kent, Washington tourism offers a rich experience for visitors of all ages. Golfers love Druid's Glen Golf Club, offering a true challenge for golfers of all levels, and downtown Seattle is just a short drive away. Even shoppers will find paradise in Kent. Our outlet mall and Kent Station offer all of your favorite stores and more. Head to the Hydroplane & Raceboat Museum in Kent, Washington for an insider’s look at the high-octane history of unlimited hydroplane racing. As the only public museum dedicated to powerboat racing in the country, the Hydroplane & Raceboat Museum offers unprecedented access to origins of the thrilling watersport, including its beginnings in the Kent/Seattle region. Featuring vintage video, photos, news archives, and restorations of award-winning hydroplanes, the Hydroplane & Raceboat Museum in Kent, WA is a thrilling attraction for guests of any age. Take a ride on a powerboat, attend one of the many events featuring the hottest new hydroplanes or learn traditional boat-building skills in the Junior Hydro Program for kids up to age 16. No matter how old you are, the history of hydroplanes and powerboat racing in the Pacific Northwest is sure to fascinate any visitor to the Hydroplane & Raceboat Museum. Located less than 50 miles from our hotel, Mount Rainier is a Washington State landmark. Rising to 14,000 feet above sea level, this active volcano dominates the surrounding national park, where you will find much more to explore than mountainous terrain, including six major rivers, an ancient forest, and wildflower meadows. Our Mount Rainier hotel gives you access to Washington's most famous park. Established in 1905, the Wonderland Trail has wound through the park for more than 100 years. The 93-mile footpath encircles the mountain, providing stunning views of the mountain and surrounding primeval forest. See Mount Rainier's changing face. It presents dramatically different profiles as you circle the peak. In the early decades of the 20th Century, park rangers, the Mountaineers Club of Seattle, and the Boy Scouts of America were the first to blaze through the Wonderland Trail, developing it for recreational use. It was named "Wonderland" to attract tourists to its scenic natural beauty. You may stumble upon ancient history at Mount Rainier. Six Native American tribes lived in the vicinity of Mount Rainier: the Nisqually, Puyallup, Squaxin Island, Muckleshoot, Yakama, and Cowlitz. From archaeological evidence, we know that people lived in the valleys near the mountain as early as 15,000 to 10,000 years ago. Tribes used the area to gather berries, medicinal plants, and other resources. The mountain remains important to the tribes to this day. When you visit Mount Rainier, you are discovering an area that has been important to human civilization for eons. A visit to our hotel near Mt. Rainier gives you access to stunning scenery, ancient forests, and Washington's quintessential natural beauty. The Outlet Collection in Seattle is the best place to shop near Red Lion Inn and Suites Kent Seattle Area. The shopping center's Seattle outlets include locations from major retailers like Nordstrom, Nike, Lane Bryant, Adidas, and Banana Republic. Teenagers can shop for themselves at Hot Topic and Zumiez. Justice and Carter's Childrenswear have fashion for younger kids. The outlets are not just limited to fashion. Other stores include Zales The Diamond Store, Vitamin World and Perfumania. Want to relax after shopping? Head to the nearby Regal Theater for a movie. With goods direct from the factory, you will find reduced prices and exceptional deals just waiting for you to capture them. The outlets also have fun events throughout the year, including Trick Or Treating and a Fall Fashion Show. There are plenty of dining options in the outlets as well. Refuel with Starbucks, or sit down to lunch at Red Robin. Subway, Panda Express, Cinnabon, and Auntie Anne's pretzels also provide meals and snacks. Make sure to take a break from your shopping spree to taste some of the great food around the outlets.